Thank You St. Johns County Voters! The half-cent sales surtax was passed by St. Johns County voters on November 3, 2015. 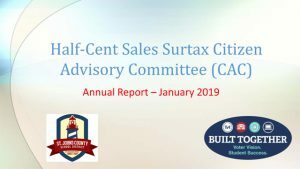 The sales surtax became effective on January 1, 2016, lasting 10 years until December 31, 2025. 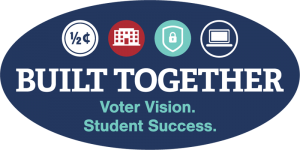 Voters signaled their approval of funding additional capital outlay project for St. Johns County students with over 60% of the vote! The revenue from the half-cent sales surtax will allow our school district to keep up with the rapid growth of the county and continue to enhance the educational experience of our students by providing funding for new school construction, school expansions, critical maintenance projects, technology upgrades, and safety and security improvements. In accordance with the critical needs project list published by the School District prior to the passage of the half-cent sales surtax, the District has completed construction on two new schools with sales tax proceeds: Picolata Crossing Elementary School (open August 2017) and Freedom Crossing Academy (open August 2018). 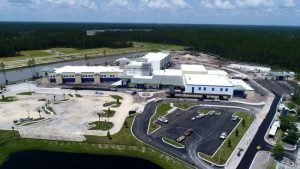 In addition to fully funding these two new schools, the half-cent sales surtax partially funded the construction of Palm Valley Academy (open August 2018). 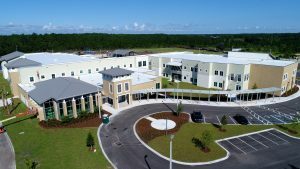 For more information on new school construction in St. Johns County, including a summary of our revised construction plans and a list of frequently asked questions and answers, please visit our New School Construction website. The District has purchased 800 MHz radios for all of the county’s school buses. These radios will allow bus drivers to communicate directly with law enforcement in the event of an emergency and will enhance the safety of students on school buses. Over 250 school buses have had GPS Systems added for more accurate and efficient location tracking. The school bus GPS system will pin point school bus locations within three feet (latitude/longitude) and ten seconds. Given this capability, the department will significantly improve response times to buses with emergencies on route while precisely projecting school bus arrival times at stops and schools. 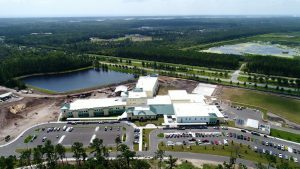 Twenty-four schools in St. John’s County School District have been able to enhance their security cameras and monitoring systems. Fruit Cove Middle School’s alarm system has also been upgraded. Over a dozen schools were updated with single point of entry projects to ensure the safety of our students and school faculty. In addition, eight schools have had school security improvement projects completed and nine schools in the District have received fencing enhancements. Patriot Oaks Academy and Swiss Point Middle School were able to have their school dining areas expanded and upgraded. The approximately 3,000 square foot addition at Switzerland Point Middle School includes minor renovations to the existing dining room and the addition of a new serving line. Patriot Oaks Academy’s dining addition will decrease cost and increase usable floor space. The 2017-2018 school year brought an improved exterior lighting system to Sebastian Middle School, as well as roofing improvements at W.D. Hartley Elementary and Ketterlinus Elementary School. Six schools have received intercom system upgrades for improvement of inter-school communication. Additionally, the P.E. Playground and athletic facility at R.B. Hunt Elementary School were renovated.